Hasham’s research is in dialogue with earlier research by leading economists regarding the debt crisis in Europe. Fiscal fatigue refers to when a country cannot collect enough revenue to keep up with the increasing interest on their debt, thus the debt continues to grow. Hasham has suggested that the theoretical approach indicating “fatigue” may be misleading. Using a different formula, it can prove to actually be the opposite, what he calls “fiscal invigoration.” Hasham describes this as the long-term shift back to a balance between a country’s expenses and income, prompting debt shrinkage. He hopes to shed light on the current ambiguity around interpreting the relationship of a government’s primary balance and debt in order to assist policy makers. 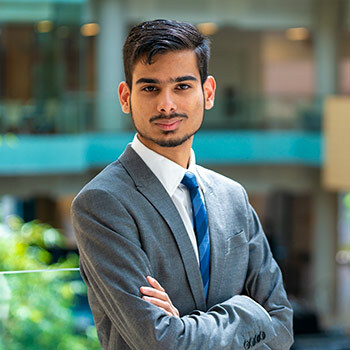 Hasham hopes to have his research published with the support of his supervisor Christos Shiamptanis, assistant professor of Economics at Laurier. Shiamptanis’ research is concentrated on fiscal sustainability issues and solvency crisis. He believes Hasham has a bright future ahead of him. Hasham’s research was presented at LCERPA’s fourth annual Undergraduate Economics Research Symposium. The symposium rewards the excellent research done by undergraduate students, encouraging them to pursue independent research and develop skills to practically apply their findings. Honourable mentions went to the other students nominated to present at the symposium. Blake Lowe presented research on how data breaches affect financial markets. Jason Bui presented research on corruption and its impact on foreign direct investment in developing nations. Hasham was also part of the team that won the Bank of Canada’s Governor’s Challenge earlier this year. He was invited by the Bank of Canada to present his research at the Canadian Economics Association’s annual conference at McGill University on June 1 and 2. After, he will be working as a trader in a bank while he considers pursuing a master’s degree in Economics or Financial Economics.